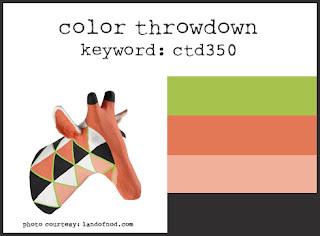 Today is my day to finally share my Color Throwdown card with you. This is the very first card I created in my new (nearly complete) studio. We have been in the process of renovating a 1949 home and we have finally moved in. Our renovation is not complete and won't be until the fall, but we were ready to move in and enjoy the spaces that we have completed. Here is this week's challenge palette which I think is fun and unusual too. I can't wait to see what everyone makes for this week's challenge. You have just a little time left to create and share your project. You can click right here for the link to join the party. What a fun birthday card! 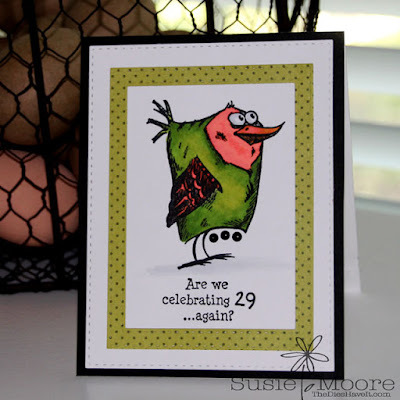 Love how you colored the bird image. Thanks for joining us at The Color Throwdown! The bird image is just tooo fun and I love the sentiment...I feel the same way...LOL!!! Super awesome coloring, too!!!! Thanks for playing along with us at the Color Throwdown Challenge!! !